This lecture at the Long Now foundation was a fascinating look at how one thousand years of Balinese ritual, ceremony, and social organization have resulted highly optimal methods of regulating water distribution, rice crop and pest control in Bali. Lansing pointed out that a simulation of adaptive networks produced nearly identical results (in terms of an optimal rice cultivation regime). Balinese culture has seemingly created, without any top-down steering or structuring, but through communication and cultural adaptation and exchange, a nearly perfect social system, in harmony with nature and yet able to absorb it shocks, pests, and climatic surprises. The system seems to work because it is an adaptive system, that is, Balinese don’t have any influence on rainfall. Their planting regimes are an adaptation to water, and only regulate water that has fallen. In other words, they dont control the weather. In system’s terms, the weather is the environment (the coincidence here is just that). To a system, environment creates information but is not under regulation or system control. The system can only respond. 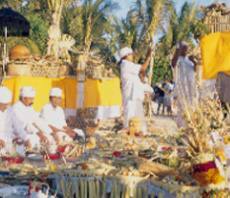 The Balinese regime also works because rice growing plots and their communities are contiguous. Decision making is undertaken by groups next to one another. This is critical for their success, as their method of pest control is coordinated flooding (to eliminate habitat). Cause and effect in this system is clear, even if it’s not explicitly referenced in Balinese traditions (which regulate and coordinate through ritual offerings to water temples). I want to think that such an alternative method of administration might still be possible. It might in places like Bali, where the environment is contained, and isolated (to some degree)–and as long as the climate and seasonal rainfall remain consistent. But can locally adapted systems survive within a global system, one in which the local system now suddenly comes into contact and communication with other cultures, values, economic regimes, trades, not to mention global climate change? Can our sciences and technologies keep up with the demands of such a rapidly changing planet? If Lansing represents cutting edge science (he hails from the Santa Fe Institute, where chaos and complexity are the order of the day), and our cutting edge research is only now finding the knowledge and sublimated systems and regulations contained in traditions like this, what hope is there that a highly interdependent set of systems, including but not limited to nation states, lacking a convincing central and coordinating body (e.g. UN, IMF, World Bank, World Court), can steer us through the changes we face in our lifetime? I don’t have a clue, thought that’s no reason to not think about it. The Balinese regime apparently has as many as 10 concurrent cycles of time. In systems theory, that would be called interenal differentiation, and the greater a system’s internal differentiation, the more it is able to “process” complex information. Our western temporal model is linear. At best, differentiated by four seasons (or quarters, if you hail from Wall St). But its motion is progressive and linear; in Balinese time, its repeating and cyclical. Does a time that moves ever forward run the risk that, someday, it may not cycle back?